Michael Freeby is a male fashion model, and celebrity fashion photographer with seborrhea psoriasis. This is a skin condition where skin can get so dry it turns into painful scales if not properly managed. While everyone reacts differently to treatments and products, I asked Michael to share his skincare tips. I'm Michael Freeby! I'm a model/photographer. I've been the face of major cosmetic campaigns (SEPHORA! ), so making sure my skin looks good is very important for me. I first discovered I had seborrhea psoriasis in the first grade, when I had an embarrassing incident while taking my school portrait. Thankfully, I looked good in the end result — complete with a neon Beetlejuice t-shirt, and Saved By The Bell style hair. Since then, moisturizing has become super essential for me — and because I have super pale sensitive skin, using sunscreen with a high SPF is also essential. Lytera 2.0 Skin Brightening Complex. Really great for reducing hyperpigmentation! Neutrogena Pore Refining Exfoliating Cleanser (original formula only - I would not recommend the containers with the "new and improved formula" sticker as they do not contain glycolic or salicylic acid). Vaseline: Intensive Care Essential Healing lotion. Alpha Skin Care Enhanced Renewal Cream w/ 12% glycolic acid. Blistex Deep Renewal SPF15 lip balm. Banana Boat: Sport Performance SPF50 sunscreen. I should definitely stress SPF as most of the products I use have AHAs and BHAs which can increase skin sensitivity to the sun, sunscreen is definitely required. 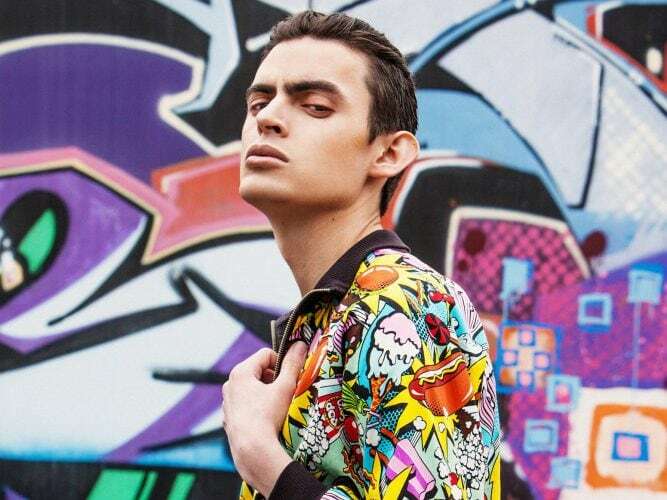 Michael Freeby's modeling has been featured by Nylon, Vogue, WWD, Bullett, The Work and more. He was recently profiled by Forbes Magazine and named one of the top 8 photographers by Women's Health. New exhibitions of his photography will be debuting this fall and winter at the EyeBeam Museum in New York City, Museum of Digital Art in Los Angeles, and a very special London event.